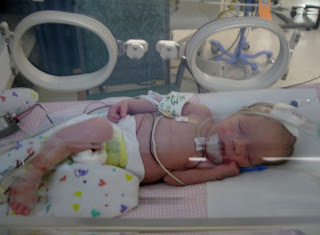 Today is my twins fourth birthday and while today is a good day, four years ago it was a completely different story. I hear all the time that the day you give birth is one of the greatest days of your life as a mother and maybe that is true for some mothers, it is not true for me. In fact it's quite the opposite; it was one of the worst experiences of my life. Four years later, I'm finally ready to write down what happened. In 2009 two days before Thanksgiving I was 30 weeks pregnant when my one year old daughter got the stomach flu. The next day I got the same flu. Only I was so sick everyday with my pregnancy that I didn't even notice that I had the flu until I started running a fever and had I'll just say other symptoms to be polite. On that morning I wasn't feeling right so I went to the hospital to get checked out. They said I was dehydrated and needed to get some fluids and sent me home. As the day progressed my flu symptoms got worse. By 6pm I went into panic mode. I knew I was severely dehydrated by now since I hadn't kept anything down for 14 hours and I just knew something was wrong. We called my mom to watch Isabella and we went back to the hospital. It took a few minutes to get a bed since it was shift change for the nurses, but once I was in the room a nurse checked on the babies. She asked me where they normally put the ultrasound wand to find the babies heartbeats. After a few seconds she paged help and suddenly my room was filled with staff members. I knew things were bad then. I can't remember exactly what happened next. I do remember getting checked to see if I was dilated and trying to crawl away from the doctor since it hurt so bad, a nurse jabbing at my arm with a needle who couldn't find a vein since I was so dehydrated, and trying desperately to focus on what the on call doctor was saying. After a few minutes the doctor told me that I had to be delivered right now and left to prepare. The nurses started rolling me to the OR taking my clothes off as we went down the hall. In my fear and stupidity I told one of the nurses that I couldn't have the babies since my baby shower was next week. Yeah, I know - I still cringe when I remember that gem. There was no time for an epidural so I was put under. I woke up after my surgery in intense pain since they were just then starting my morphine drip. I asked about Mark and Molly but no one could tell me anything and Brett wasn't there since he was with them. 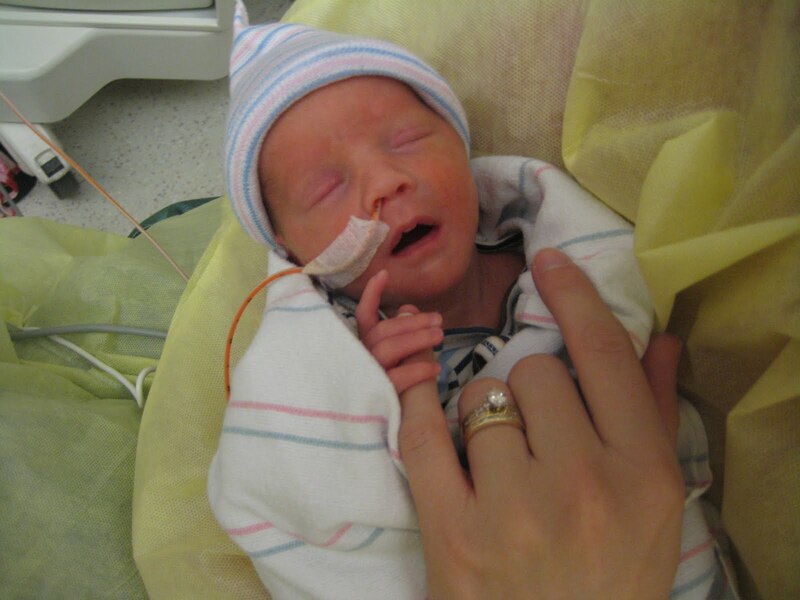 Finally a NICU doctor came in and told me that my babies were alive but they had a long road ahead of them. At 30 weeks I was reassured that 9 out of 10 babies live. Trust me, I didn't feel reassured at all! Since I was running a fever I wasn't allowed to go to the NICU. It was Wednesday night; I wouldn't get to see my babies until Friday morning. Not only was I not allowed to see Mark and Molly, but the hospital wouldn't allow Isabella to visit since no one under 18 was allowed in the rooms in my hospital. I was miserable that Thanksgiving! 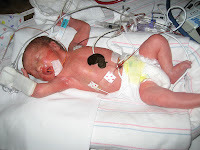 There was no turkey dinner with family, I was alone in the hospital, and my babies were on life support. People visiting me and the nurses kept congratulating me on the birth of my twins. To this day I have no idea what they were congratulating me on. The first time I saw Mark and Molly I sobbed. They were so tiny and too fragile for anyone to hold them. All we could do is place our hands on their skin and look at them. I've never felt so helpless in my life than looking at my children knowing that they were sick and not being able to do anything for them. All I wanted was to hold my babies and let them know that mommy was there for them, but it would be a week before I could do that. Brett holding Molly for the first time. Mark and Mommy for the first time. The NICU is a scary foreign place when you first arrive. There are so many monitors and alarms and my novice ears didn't know which alarms were important and assumed the worst every time one went off. It is a skill that would only take a few days to learn. It also doesn't take long to be reminded that not all the babies survive. While Mark and Molly were there three babies died. I cannot describe the horror of watching parents lose their child. Mark's hand 4 days old. Even though I know I am incredibly lucky as a mother that my 30 week preemies survived, I still feel cheated. I wasn't conscience when my twins entered the world. No one held their tiny little faces up to my head so I could see them. I didn't get to hold them after they were born. I didn't even get to see them for 2 days. Adding insult to injury, they were in the NICU for a very long time and we had some terrifying days along the way, the worst being the night we were told Molly probably wasn't going to live through the night. Here we are four years later, and I will say that I still have a hard time with Mark and Molly's birthday. I'm able to celebrate with them and enjoy it for the most part but there is a part of me that gets sad and remembers how terrified I was four years ago. I don't think that will ever go away, it's just a part of their birth story. I am very thankful that my birth story has a happy ending, so many do not. 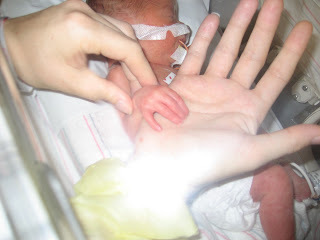 I am also thankful for the amazing care that my babies and I received while we were in the NICU. 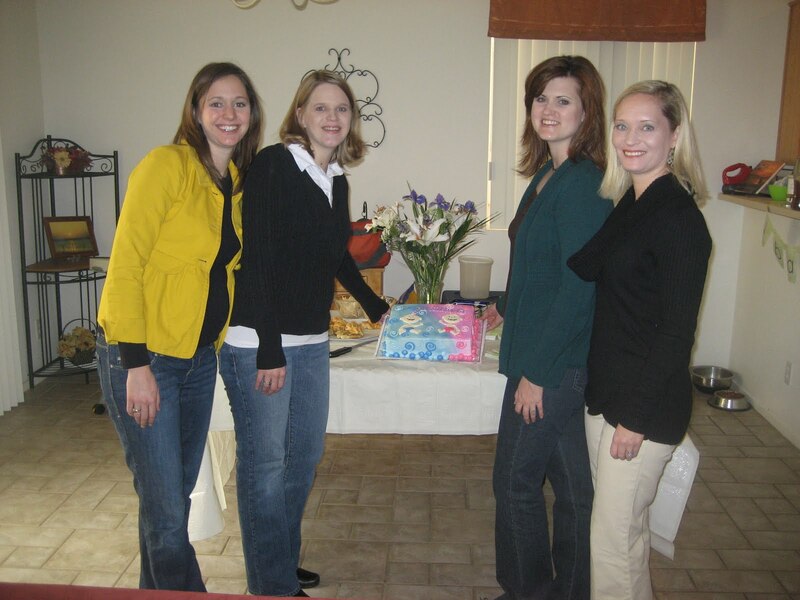 I am thankful for my friends and family who surrounded us with love during our 50 day NICU stay. We were so fortunate to have a support system in place so we could be at the hospital and someone could watch Isabella, not to mention all the meals and cleaning that they did for us. Their birth story might be bitter sweet, but the memories of how many people came to our aide after they were born will always be precious to me. Happy Birthday to my sweet babies! Thank you for sharing this. That was a very traumatic event. My mother still has some PTSD issues from my brother being born as a preemie 37 years ago. It really does stay with you. What a terrifying experience. I can understand why you'd have a hard time with their birthday. It's not exactly what we plan when we are pregnant. I am so happy to hear they are alive and well. Certainly a lot to be thankful for. I can't imagine such a terrifying start to what should have been a joyful time! But I am so glad that life has brought healing and laughter and growing babies! Happy Birthday, Mark & Molly! 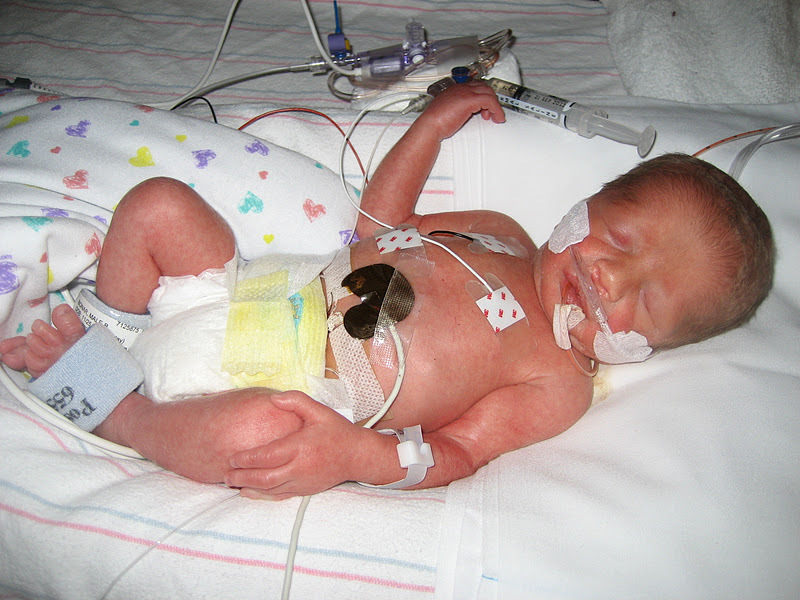 My twins were born at 34 weeks and also spent time in the NICU. I have strong feelings of love and hate towards the hospital. I think that it's hard when you're expecting things to happen a certain way and it goes a different way--especially when you're pregnant. Sometimes I feel sad, too, because I missed out on those first moments - holding my girls together, being the first to hold and welcome them to the world. One of my twins came home a month earlier than the other. I have buckets or feelings on things surrounding that month. Sometimes I still feel like my twins should have certain experiences since they are twins. It seems unfair when medical needs interfere.....even when I'm also grateful for those medical advances. Happy Birthday to your sweet little ones. Thank you for sharing your story! 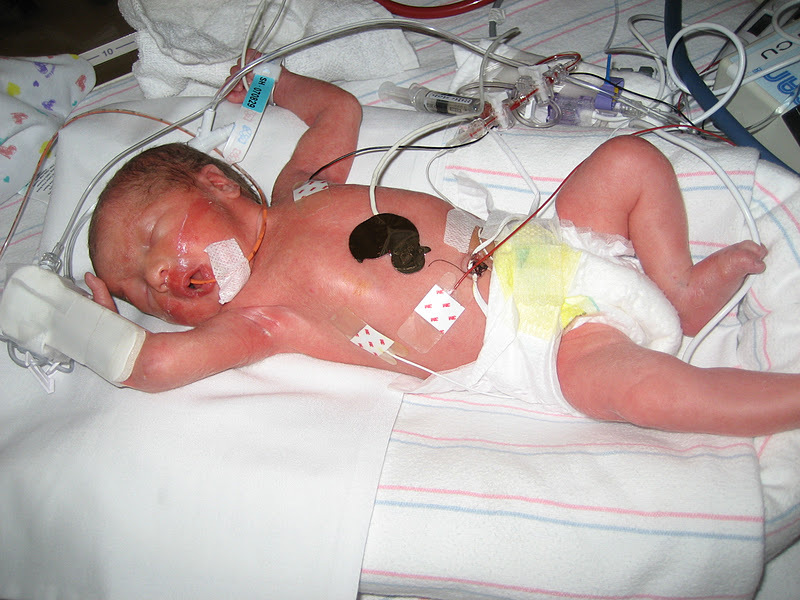 I spent 4 weeks in the hospital with 2 pregnancy's. Such a scary time in our lives. Early labor seems to be the norm for me. I thank god I was blessed with happy, healthy children. I am glad your story has a happy ending as well. That had to be so terrifying. I wouldn't be looking back on that day with joy, either. I'm so glad your kiddos are okay. Happy birthday to them! I have a couple of friends who did not have happy birth stories either. It takes a long time to get over. I hope going forward you can begin to celebrate each passing year, rather than feel sad about how they were born. I can't imagine the memory of that terror ever going away, but I'm so glad there's a happy ending to read. I hope they had a wonderful birthday.